i hypnotiesed myself once, screamed every time i went to the toilet. That website is pretty neat! Happy birthday Ali! The comic is a good reference: I didn’t really understand it until I went to the site, though. Your friend’s art is pretty awesome. Thanks for sharing it. Looks like Biff is being attacked by two Coral Snake hand puppets. What fun it is to share a birthday. Happy Birthday Ali! Coral snakes are red yellow and black. I couldn’t help but be reminded of Penny Arcade by this comic. Biff, WHERE ARE YOUR PANTS. I AM ASKING YOU A SERIOUS QUESTION ABOUT THE LOCATION AND CURRENT STATUS OF YOUR PANTS. It looks like a fine birthday gift to me. @ Kaikuro: Maybe they cross-bred with peppermint snakes. Now, can you tell the difference between a Coral Snake and a Milk Snake? Coral Snakes have the pattern Red, Yellow, Black, Yellow, Red. While Milk snakes have the pattern Red, Black, Yellow, Black, Red. Oh, and milk snakes are harmless. 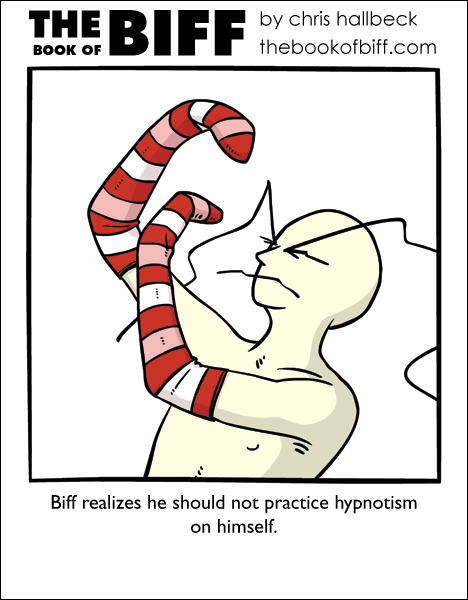 Does hypnotism wear off or will Biff still be a ‘graceful melody’ next week? Thank you for reminding me of a time and a place and a girl who one day, inspired by words carved in stone on the side of the Auditorium Building, added her own to a well scribbled-up fire exit door. And thank you for hosting my message in a bottle. I think Jim Croce will be my soundtrack for today. I just want to say I have enjoed the magician week. I’m actually reading a book about how to hypnotize yourself. o.o It doesn’t work very well for me, though. Right now I’m trying to ask questions to my sub-conscious and have it answer by moving my fingers, but since my nerves got damaged when I was a child my fingers sometimes twitches by themselves. At first I will believe that’s an answer, then I remember that the finger will rise to a pointing position and not just twitch around. And my sub-conscious doesn’t like to answer my questions. Ever.